SA 2 Telugu 8th Class Question Paper Download, SA 2 Hindi 8th Class Question Paper Download, SA 2 English 8th Class Question Paper Download, SA 2 Maths 8th Class Question Paper Download, SA 2 General Science 8th Class Question Paper Download and SA 2 Social 8th Class Question Paper Download. AP Summative Assessment II - 8th Class 2019 All Subjects SA 2 High Schools CCE Model question Papers and Blue Print for Telugu, English, Mathematics, Physical Science ( PS ), Biology ( NS ) and Social Subjects Question Papers. IX Class SA 2 Paper 1 and Papers 2 question Papers. AP Summative Assessment II Annual Exam Question Papers and 8th Class All Subjects SA 2 Question Papers Download for AP Schools. AP High Schools and Upper Primary Classes SA II question Papers 2018-19 Summative Assessment 2, 8th Class SA2 Telugu, English, Maths, Physical Science (PS), Biology (NS) and Social Subjects Question Papers with Hand writing and Printing and Annual Exams Question Papers. Andhra Pradesh High School/ UP Classes Summative Test 2 Conduct Written only 50 Marks in 8th Class below Annual Exams Question Papers prepared our teachers and Previous years Question Papers. So, this Question Papers in Hand writing as per SSA Norms in Andhra Pradesh. Tags: 8th Class SA 2 Question Papers all Subjects, Telugu 8th SA 2 Model Question Paper 1 & Papers 2, 8th Hindi Summative Assessment 2 model paper, AP Summative Assessment 2 Class IX model papers, SA 2 Maths 8th Question Paper, 8th SA 2 Physical Science Previous Question Paper, 8th SA 2 Biology Previous Question Paper, English 8th Class Summative 2 Questions, SA2 Social 8th Sample question Papers. 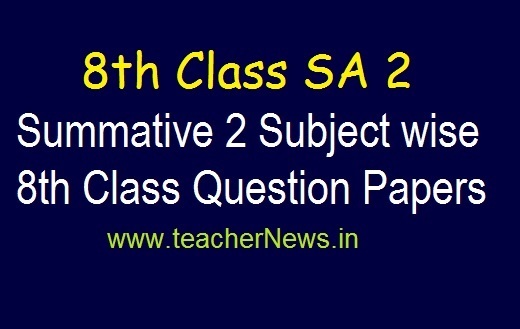 8th SA 2 Model Question Papers, Summative 2 Exam 8th Class Question Papers 2019, AP Summative II 8th Class Subjects Question Papers Download.